Today's So Shoe Me is the Arrow by DV8 by Dolce Vita, $145, available at Solestruck. I'm all about the recent revival of chunky, grungy and androgynous styles from the 90s, but sometimes I just want to feel pretty and feminine and the Arrow pump by DV8 is the perfect flirty floral heel. 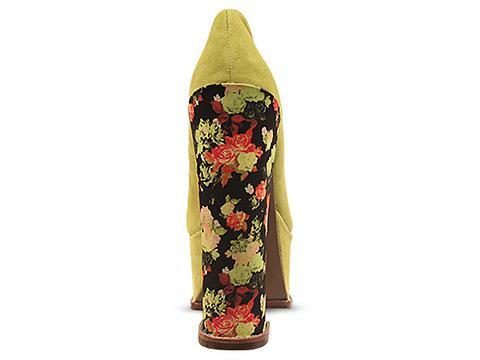 The fresh celery suede and floral wrapped heel add a classic spring colorway to these modern platform pumps. The towering 7" heel is surprisingly wearable with a comfortable block shape and 2.25" platform. Take a chance with print mixing and pair these heels with a camo tee and 90s inspired denim jumper for a relaxed spring look. So Shoe Me a pair of femme floral heels that will add a fresh pop of color for a signature spring style that's in full bloom.